Beautiful hand polished cast fascia in satin chrome finish or black. An eclectic mix of classical design features from period fireplaces that transcend the fashions of time. This beautiful fire is built on the best selling full depth radiant platform and is available in manual control as the eko 3080. The decorative solid cast iron fascia is simplicity and elegance at is best. It is a design that is equally at home in modern and traditional interiors. 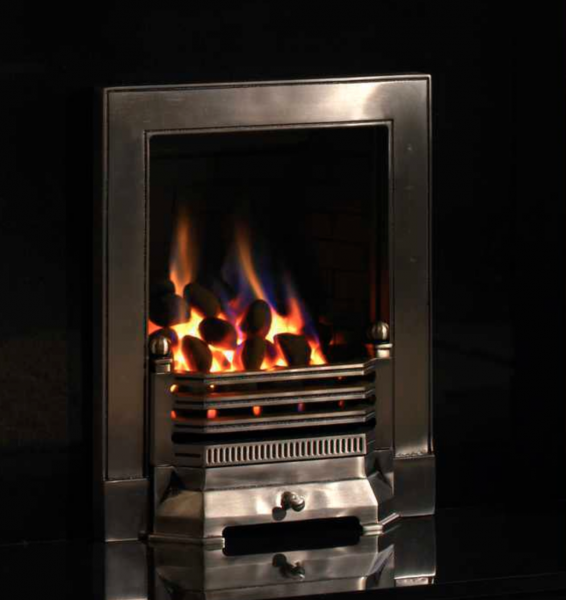 The eko 3080 full depth radiant firebox creates a lively and realistic flame picture with powerful glow radiating out from the heart of the fuelbed. The firebox is also lined with reversible ceramic panels, which help to increase the efficiency. Both models also feature as standard our decorative log fuelbed to complement the solid fuel inserts and grates typically found in the 18th and 19th centuries. All of our gas fires incorporate two safety features; an Oxygen Depletion Sensor (ODS) and Flame Failure Device (FFD) which detect and cut of the gas supply for complete safety and piece of mind.